Figure skating is the most beautiful and mysterious of all sports. When the skaters are on the ice, every twitch of a muscle and every slip of a skate blade is visible for the world to see. In Inside Edge, Christine Brennan chronicles–for the first time–a season on the skating circuit, intimately portraying the lives, on and off the ice, of the sport’s current and upcoming stars. Woven into the narrative are stories of figure skating luminaries past, present, and future–including Peggy Fleming, Katarina Witt, Brian Boitano, Scott Hamilton, Kristi Yamaguchi, Nancy Kerrigan, Oksana Baiul, Michelle Kwan, Rudy Galindo, and Tara Lipinski. 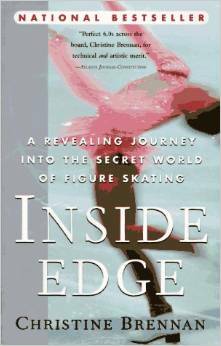 Revealing the backstage conflicts high-profile figure skaters face, and the ambition that drives them, Brennan also tells the stories of their families, of improbable rises to the top, and of wasted talents. Inside Edge is available via Amazon and other retailers nationwide. Buy now.